Other modes of transport: KSRTC buses and private vehicles. 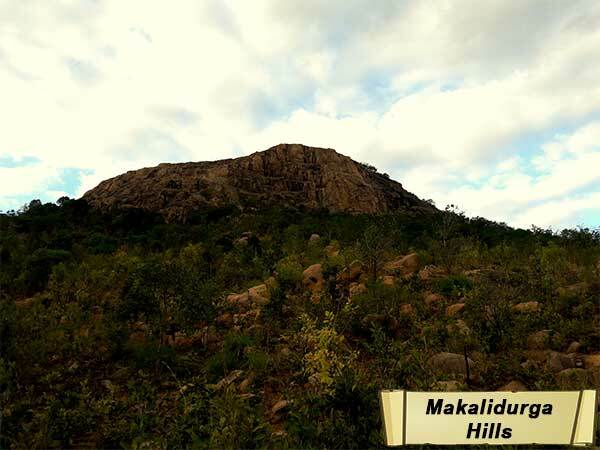 Makalidurga trek is something that every trekker near Bengaluru would certainly have on their bucket list. Conquering this monolithic hill is not as easy as we think. The trail of the trek is just 8 km however, the level would certainly fall under moderate to difficult because of the rocky terrain and the inclination of the hill. If you are travelling in your own vehicle, you may choose to go till the base of the trek without actually walking on the railway track. The trek starts from a railway track as soon as you get down from the train at the Makalidurga railway station. You may have to walk for a couple of kilometres before reaching the base point. As soon as you touch the base camp, you can choose to rest under the shelter of an ancient temple of Lord Krishna. You would also get to catch a glimpse of the villagers along with their cattle. Legend says that the construction of the fort dates back to the era of Vijayanagara empire where they trained the army personnel before it was captured by Shivaji's father (Shahaji). Then it came under the rule of Kempegowda, the founder of Bangalore city. The fort also has an ancient temple dedicated to Lord Shiva and Lord Nandi on the top of the hill. The trekking trail can be divided into 4 parts. The trek starts from the railway track and continues for a couple of kilometres. The next stretch starts from the base of the Krishna Temple to a junction where the rocky terrain kicks-off. The third stretch is where we would be climbing amidst the rocks and trees, the inclination is not that tough but we need to be a little careful. The last stretch would be to reach the fort which is really strenuous. There are directions marked with a piece of chalk on the rocks to help the trekkers find their way out easily. These are granite rocks and hence the climb becomes slippery if we do not pay proper attention. The view from the top of the hill is breath-taking, you may choose to explore an ancient cave that is on the top along with some fort ruins and the temple. You may wait to watch the beautiful sun going down as you climb down. Night trekking is also allowed at this place and a lot of trekking enthusiasts prefer to go there during nights to explore the serenity of the place. This place becomes extremely hot during summers and it would be better to start the trek as early as 6 AM in the morning. Do not forget to look back after completion of every stretch; the view completely changes from every perspective. The beautiful formation of clouds amidst the clear sky is a feast to the eyes.The texture of the rocks and the soil has to be noticed to feel the place completely. The monkeys that hop around the place with complete ease and the glimpse of the South American continent from the top of the hill. Makalidurga is a photographer's paradise; with the trees and the clear sky and the ruins in the background make it a perfect frame for shutter bugs. Exploring the caves and rock-climbing can also be done if you are an adventure freak. Watching the sunset from the top of the hill is soul-filling. Watch the peacocks and peahens while on your way back from the climb. Carry a minimum of 2 litres of water. Carry your own food and snacks as there are no hotels until Doddaballapura. Carry a torch while on night trek. Carry a rain jacket and a wind cheater as the weather may change at any time. What Do You Get At Makalidurga? Biscuits, Chocolates and Water are available at the stores nearby the railway station. Tender coconuts are available at the base of the trek and also after the second stretch. Beware of the eatables you carry, the monkeys here are pretty mischievous and they would not mind snatching it away from you. Wear comfortable clothes and footwear to avoid hurting yourselves while trekking. Please do carry your own water bottles to avoid dehydration. Be careful with the cameras and any other gadgets as the climb is difficult to avoid any damages. Plan your visit to this adventurous trekking destination and get the glimpse of the beauty amidst the ruins.